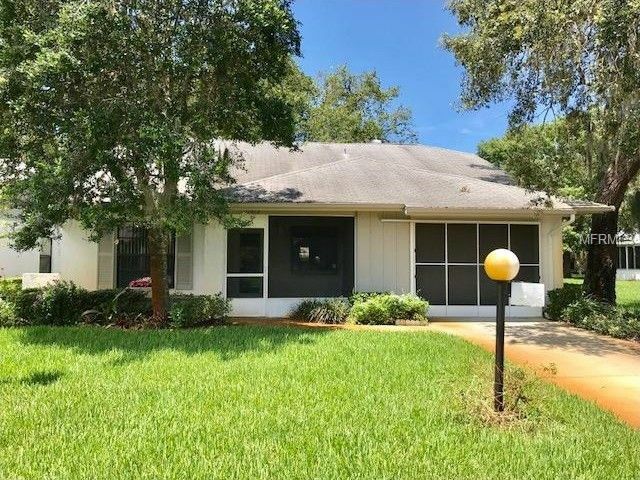 EXPANSIVE SINGLE FAMILY HOME IN POPULAR 55+ COMMUNITY: THIS LOVELY 2/2/1 HAS OVER 1400 SQ FT OF LIVING AREA PLUS12X24 GLASS ENCLOSED FLORIDA ROOM; OPEN FLOOR PLAN; HUGE GREAT ROOM WITH VAULTED CEILING & WET BAR ADJOINS FLORIDA ROOM & MASTER SUITE WITH VAULTED CEILING, WALK-IN CLOSET & SHOWER BATH WITH NEWER VANITY; SPLIT BEDROOM PLAN; GUEST BEDROOM& GUEST BATH WITH TUB; LARGE EAT-IN KITCHEN WITH FULL APPLIANCE PACKAGE,PANTRY, GARDEN WINDOW, PASS THROUGH TO GREAT ROOM & WOOD LAMINATE FLOORING; NEUTRAL CARPETING THROUGHOUT INCLUDING FLORIDA ROOM; CEILING FANS GALORE; SCREEN ENCLOSED ENTRY; OPEN PAVER PATIO WITH WONDERFUL REAR & SIDEYARD VIEWS; FRESHLY PAINTED INTERIOR; NEWER A/C IN 2008 (NEW COMPRESSOR 10/2017) & NEWER WATER HEATER IN 2008;NEW SHINGLE ROOF (8/2017). GATED COMMUNITY WITH ACTIVE CLUBHOUSE, POOL, TENNIS, SHUFFLEBOARD, BOCCI, EXERCISE ROOM, POOL TABLES & CARD ROOMS. MODEST FEES COVER EXTERIOR PAINT, LAWN MAINTENANCE, SPRINKLERS, WATER FOR SPRINKLERS, CABLE, TWICE PER WEEK GARBAGE PICK UP, BEAUTIFULLY REMODELED CLUBHOUSE & 2 POOLS. 1 SMALL PET ALLOWED; GOLF AVAILABLE. PER PUBLIC RECORDS, NO FLOOD INS REQUIRED. NOT A FORECLOSURE. NOT A SHORT SALE.